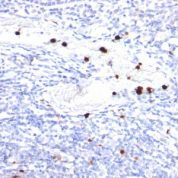 This MAb recognizes granulocyte-colony stimulating factor (G-CSF) in the cytoplasm of mature granulocytes. It shows no reactivity with any other cell types. Markers of myeloid cells are useful in the identification of different levels of cellular differentiation. It reacts with early precursor, mature forms of myeloid cells. It is useful for the detection of myeloid leukemias, granulocytic sarcomas. 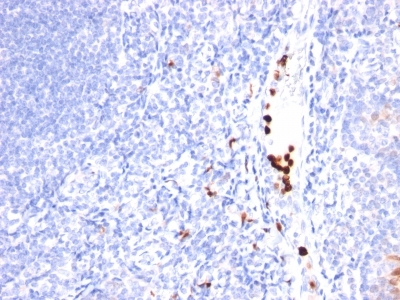 It can be used as a marker of granulocytes in normal tissues or inflammatory processes.G-CSF is a pleiotropic cytokine that influences differentiation, proliferation, activation of the neutrophilic granulocyte lineage. The human G-CSF cDNA encodes a 207 amino acid precursor containing a 29 amino acid signal peptide that is proteolytically cleaved to form a 178 amino acid residue mature protein. Two G-CSF s, which are identical except for a three amino acid deletion in the amino-terminus of one form of the protein have been isolated from human cells. Murine, human G-CSF s share 73% sequence identity at the amino acid level.